This commuting guide via jeepney is brought to you by We Love Cebu so you can travel within Metro Cebu as cheaply as you can by taking public transport. For tourists and visitors coming here for the first time and who wants to know how to get out of Cebu-Mactan Airport and get to Crown Regency in Fuente or Zubuchon is One Mango or the various cheap pension houses in the area, here is a useful taxi and jeepney guide for you so you can save on your fares. As you exit the airport, you can take a yellow taxi right outside at the arrival area. Flag down fare is P70. You can also opt to ride a metered white taxi, you can find these outside the departure area. Just take the stairs to go up as you exit the arrival / baggage area. You will probably shell out around P280 to P350. As you exit the baggage and arrival area, go up the stairs. You can find the yellow muticab that serves the Mactan airport outside the international departure area. Get on this, cost of jeepney ride is only P8. Get off as you pass by the Marina Mall and airport intersection, you will see a traffic light and the multicab will take a left turn. You will be passing by Zubuchon that is within the Mactan Island Stay Hotel. Further on you will see a skywalk or a flyover. Get off just before you reach the skywalk, that will be front of Pusok Elementary School. Wait for jeepneys bearing the sign board “Highway” or “Coliseum”. Get on this. Get off the jeepney a few meters after it passed by Mandaue Coliseum, preferably in front of . You will know your jeep is approaching the area because the drivers or conductors will usually shout “Coliseum” “Coliseum” to prompt those passengers getting off in Coliseum. *Conductors are assistants of drivers, some jeepneys have them. If the jeepney you are riding at have one, you will give your fare to him. When you get off the highway jeep from Opon or Lapu – Lapu City, almost always you will see other passengers waiting for jeepneys by the roadside or Mandaue jeepneys with various routes queuing and waiting for passengers. Get on a jeepney that bears the sign at its windshield “Mabolo”. We will update this later on with the jeepney codes that goes there. To confirm ask driver if he is passing “Carwash”. Ride that jeep once the driver confirms, fare is P9. You will be passing through Mandaue Highway, pass San Miguel Beer Complex, Subangdaku Flyover, then you’d enter Brgy Mabolo. Your driver or conductor will usually ask “Naay carwash” meaning they are asking if someone is getting off in the “carwash”, a local landmark. In “carwash” which is across the Metrobank Mabolo branch, there are already 03Q jeepneys that plies the route Mabolo – Mango Avenue – Fuente. Fare is P8. Ride this Fuente bound jeepney. If your intended destination from the airport is One Mango or Robinson Mall Cebu or Summit Circle Hotel, get off in “National Bookstore”. National is right after you passed by St Theresa College. Next jeepney stop is already in Jones Ave, so you should not make this mistake since it’s a bit of walk from Jones – Fuente area back to Mango Ave. If you are going to Crown Regency Fuente to try out the various Sky rides and adventures or to the famous Larsian Barbecue and grilling hub, get off after the jeepney circles the Fuente Rotunda and take a slight right turn passing the Fuente skyway. You will see the looming building of Crown Regency right across, get off there. We plan to add maps on this later to make this Cebu commuting tips more handy and for your easy reference. We hope you find this commuting guide in Cebu useful. If you like us to have more travel post related to taking public transpo, please show your approval by clicking on LIKE below. You can also SHARE this jeepney tips via Facebook or Twitter by using any of the social network button below. 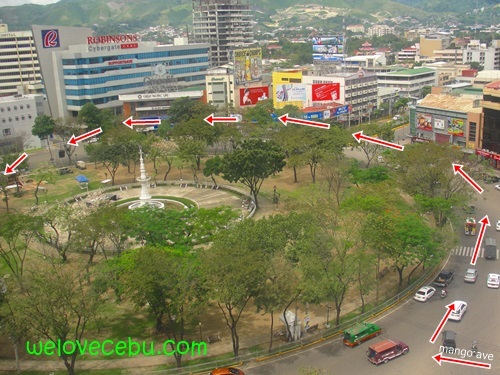 Join our Cebu community in Facebook or in Twitter @welovecebu. Show your love for Cebu!